cuisine of the country I was born and raised in. resembles both in name and form the cuisine of its neighboring countries. thing to happen not to mention bringing food ideas from there. article. Azerbaijani cuisine IS unique and original in its own way. cuisines! The techniques we use to make our dishes are different too. my Azeri journey, such as sour cream and salmon, are Russian in origin. over the world, to my knowledge, not only in Russia. baste chicken in sour cream for Djudja Kebab. you’ll have a different opinion on Azerbaijani cuisine. Azerbaijani cuisine. It is still new and I will be adding more post to it. revise the section on Azerbaijani cuisine in your recipe project. A few years ago I cooked an Appalachian dinner, and in my description of my impressions of the region I wrote how I’d imagined it to be “poor, backwards, even third-worldish.” Many people from Appalachia took offense with that description, and I have since gotten a lot of hate mail about my comments. I can’t, in good conscience, apologize for them as they were true. That’s how I imagined Appalachia to be. That’s how Appalachia has been portrayed by books, movies and TV – and indeed, that’s why Appalachia is of any interest at all. It is offensive to me, as a person from the third world, how many people take offense at being called “third worldish”. This “we are better than you” attitude that they have is, if nothing else, laughable. Still, I believe in freedom of speech and here are a couple a comments I’ve gotten. I had more but I can’t find them now. I got another message from a Bolivian woman angry at my comments about Bolivian food. Oh well, honesty just doesn’t jive with some people. In any case, I understand her points. It’s true that I only spent a few days in Bolivia, and that I probably did not try the most traditional Bolivian dishes (honestly, I can’t remember what I had back then – just that it was not memorable), and I’m sure that cooked by an experience cook some Bolivian dishes would be wonderful. But if a cuisine does take years to learn, then it’s clearly not for me. What has been great about this project is discovering a whole lot of cuisines that are very accessible to a foreign cook. One of my readers, a Bolivian living in Japan, was dismayed at my feelings about Bolivian food as represented on the page on the matter. She understood how difficult it was to get inspired by a cuisine when you can’t understand half the ingredients and dishes you come across. So she helpfully sent me a “dictionary” of Bolivian food, describing dishes and ingredients. I cannot help her enough, and I that I’m speaking for many people who will come across this page searching for this information. From time to time I’ve gotten comments on my write ups about the different cuisines I have explored. Mostly they are complimentary, but sometimes people are very offended at what I’ve written and want to set me straight. For example, I got a lot of hate mail regarding my write up of Appalachian cuisine – apparently a newspaper columnist there organized a letter writing campaign to let me know how offended they were at my thoughts. My Assyrian menu has also generated some mail from Assyrians who tell me that I did it all wrong. They’ve promised to send me recipes so I can cook a real Assyrian meal, but so far I haven’t gotten any. 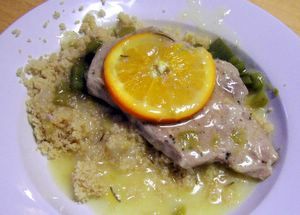 But no individual recipe has received more comments than my recipe for coucou, a cornmeal dish eaten throghout the Caribbean. Apparently I did it all wrong. Here is the last e-mail I’ve gotten on the subject. “Of course you, probably a white woman, would find the dish bland but if you were a native you would understand that cou-cou is not a stand alone dish. The national dish of Barbados is “cou-cou and flying fish” and like mash potatoes and gravy, the flavor of the cou-cou comes from the gravy of the fish. If you do not have flying fish, you could use any other steamed fish, liver, etc. anything that makes a good gravy. If the picture on your website is the result of what you made no wonder it was bland cause it looks like poop which means you probably made it wrong.